The New Orleans Roosevelt Review was the house organ of the Roosevelt Hotel (now the Fairmont Hotel), "a magazine published monthly for the guests of The Roosevelt in New Orleans, intended to entertain guests and explain New Orleans to visitors." 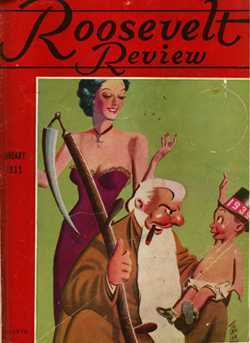 It began publication in December, 1937, and continued until at least March of 1968, the date of NOPL's last issue. The Roosevelt Review typically included photographs and articles on current events in New Orleans, photographs of celebrities and other guests of the hotel and promotional photos of events and patrons in the hotel's lounges and ballrooms and in the famous nightclub, the "Blue Room." Also prominently featured were historical and biographical vignettes about New Orleans and New Orleanians, Louisiana and Louisianians. Among the local historians who authored these articles are Richard R. Dixon, M.H. Herrin, William McFadden Duffy, and Samuel Wilson, Jr. This index reproduces the card index to the journal prepared during the 1950s and 1960s by New Orleans Public Library staff. The index is limited to historical, biographical, or "local interest" articles and omits the articles promoting the hotel itself. Subject headings used are, for the most part, Library of Congress headings in use at the time the index was produced. Some articles appear to have been reprinted a number of times over the life of the journal. Readers of the Roosevelt Review should be aware that the journal's historical/biographical articles cannot be said to be scholarly in nature and that they reflect the viewpoints and, to a certain extent, the biases of the time in which they were written. The Louisiana Division holds a nearly complete set of the Roosevelt Review; scattered issues are wanting. Tulane University's Louisiana Collection also holds a sizeable run of the journal.